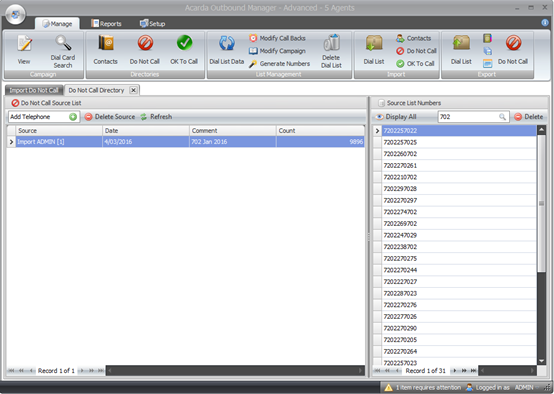 The OK To Call (OTC) feature in Acarda Outbound enables you to call telephone numbers even though they may be found on the Do Not Call list. 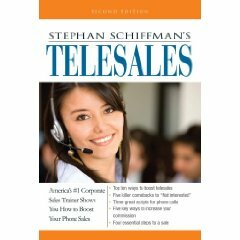 In some case a business may be able to call a number, if they are for example a customer, or if the person has given the business permission to call. There will be different regulations for the permissible timeframe during which the business may call the number so you need to investigate the rules in your location. 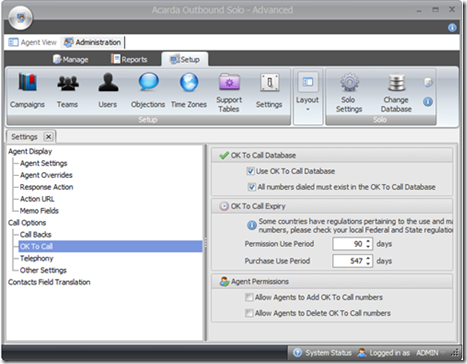 This blog will detail how to set up Acarda Outbound for OTC lists and our next blog after this will detail how to import and view the OTC lists into Acarda Outbound. 1. 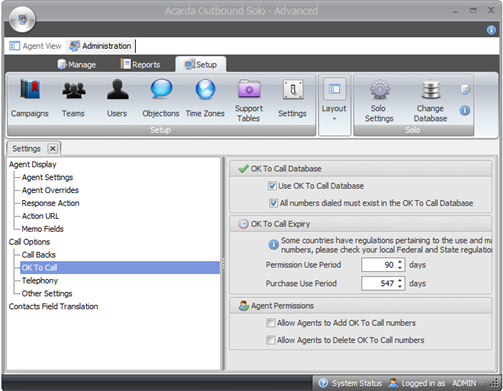 Open Acarda Outbound Server Administrator software. 2. In the left sidebar click on Database Settings link. 3. 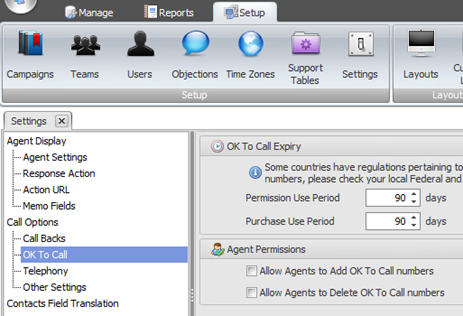 In the main panel, check the check box for “Use OK To Call Database”. 4. 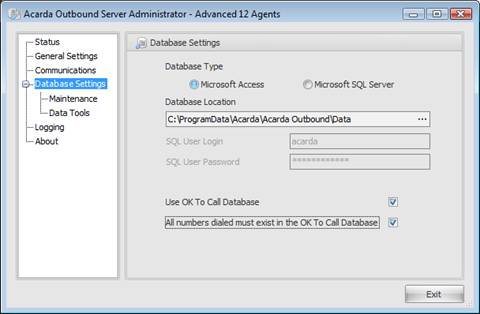 In some instances you when you only want to call numbers that are found on the OTC list then also check the “All numbers dialed must exist in the OK To Call Database”. One example when you might do this could be when you have a scrubbed list which is good for say 60 days. You can import that to your Campaign and also import it to the OTC database with Permission Use Period set to 60 days. Be careful to set the correct period, just the days that remains in the calling period at import. 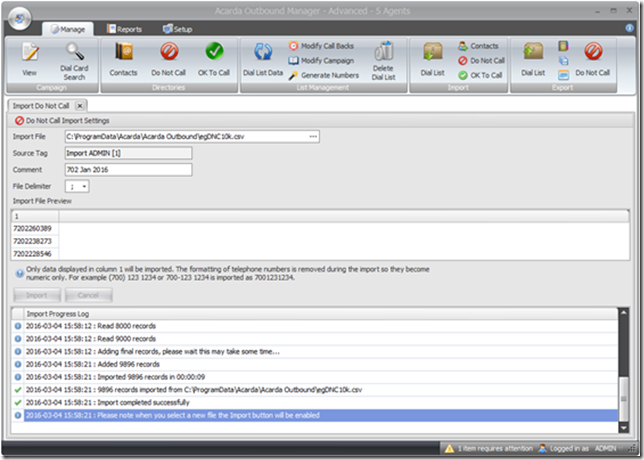 Step 2: Next in the Acarda Outbound Manager software you need to set the permission periods. 1. 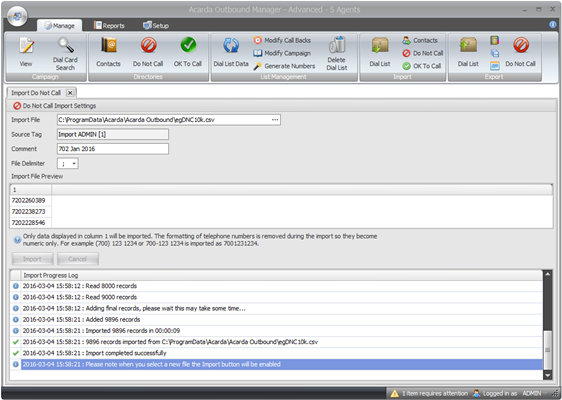 Open Acarda Outbound Manager software. 2. Click on the Setup Tab. 3. Click on the Settings icon in the Setup group of icons. 4. 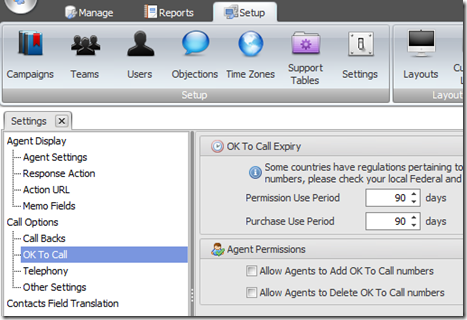 Click on the “OK To Call” link in the left tree view menu under “Call Options”. 5. Set the correct number of days for expiry of the OK To Call numbers for the Permission Use Period which is when you have been given permission to call; and also, for the Purchase Use Period which is the period of time post-purchase when you are permitted to call the customer. 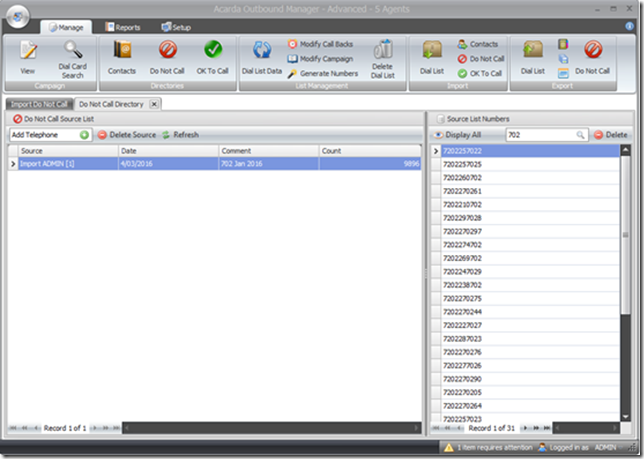 Our next blog will detail how to import and view the OTC lists into Acarda Outbound. Please contact us if you have any questions via http://www.acarda.com/contact/ or call us toll free in the USA on 800 728 2050.